My son, Brendan, the wilderness escapist, has a camper van he has named Koda. This is his fourth camper vehicle in the past ten years, each one an improvement over the last. Koda is a brand spanking new, custom-built, masterpiece. The fruit of an enormous amount of planning, reflection, and development stemming from the past versions, Koda slowly took shape over this past year and amid much fanfare, Brendan and his family finally took position of their new "mobile" home this past spring. This is their dream vehicle, their ticket to ride. 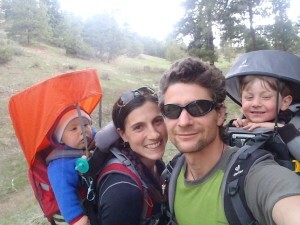 The four of them (Brendan, his wife Chloé, and two small children) are now off on a year of intermittent travel, camping, and rock climbing. Brendan recently told me: "With Koda, the legacy of Cowabunga continues." I was pleased that he saw it in that light. It's hard to know, as your children grow up, what will stick and what won't. On Cowabunga, our sailboat home for 10 years, we created our own world. It was our cocoon. It was our joyride, our ticket to ride. We didn't need to pack a suitcase whenever we traveled to a new place. We did, however, have to put away toys, tie things down on the deck, and make sure the interior was tidy so nothing could spill or break under sail. It was so nice knowing that our toothbrushes stayed in the same place! For days, sometimes weeks at a time, we wouldn't set foot on land: no grocery stores, no errands to run, no kids to transport from here to there. There was a peace to this existence, almost a meditative state at times. We had the time to take the time to live. Brendan is still in tune to that rhythm. He never let it go. He always yearns to be in the outdoors, with the outdoors, and live autonomously just outside the reaches of civilization. But as he transitioned his world from the sea to the land, he now finds his peace and inspiration in the incredible landscapes of the mountains, the canyons, cliffs, and plateaus of backcountry wildernesses. His wife, Chloé, shares that, and together with their children they rock climb. Koda, gives them this freedom to be autonomous. This is their cocoon, their version of Cowabunga. The name "Koda" is said to be a Native American word, possibly from the Dakota, Lakota, or Nakota tribes, meaning "friend" or "companion." It is fitting that 25 years later Koda has come along, sort of a son of Cowabunga, to carry on the spirit. I don't think I could have come up with a better name for Cowabunga reincarnate.